So, You need a easy to make gift? 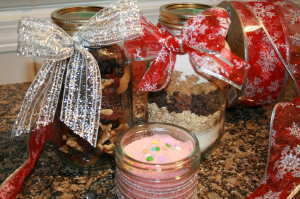 Homemaded Gifts In a Jar Recipes makes a great present. Remember to firmly pack down all ingredients. Store your Gifts In a Jar Recipes in a cool, dark place for up to 3 months. Mix salt, baking soda and flour together, then layer the ingredients a large jar in the order listed, with the chocolate chips on top. Preheat oven to 375 degrees F (190 degrees C).In a large Mixing bowl add 1 cup unsalted butter or margarine(softened), 1 large egg and 1 teaspoon vanilla and blend together. Sift dry ingredients through a colander to separate the chocolate chips from other ingredients. Combine the sifted ingredients into well mixture until blended. Stir in chocolate chips. Drop teaspoonfuls of dough onto a greased baking sheet. Bake 8 minutes or until lightly browned. - Mix together the flour, baking powder and baking soda. - Layer ingredients in order given in a 1 quart jar. "Important" Press down each layer firmly making sure you really pack it down before you pour in the flour mixture, it will be a tight fit but it will work. Chocolate Covered Raisin Cookies Preheat oven to 375 degrees F (190 degrees C) Empty jar into a large mixing bowl. Combine mix thoroughly. Add 1/2 cup butter or margarine(softened) Add 1 egg and 1 teaspoon vanilla Combine together until you know it is well mix together. Shape into walnut sized balls and place on greased baking sheet. Bake for 13 to 15 minutes until golden brown. Remove cookies to racks to finish cooling. Use a clean 1 quart jar and press each layer down firmly. Put in half of the flour along with the baking powder and baking soda. Add the spices and the remaining flour. Add the brown sugar last. Tie a ribbon around the top of the jar and attach the cookie cutter and the directions below. Attach these directions to the jar: Gingerbread Cookies Empty jar of cookie mix into large mixing bowl. Mix thoroughly. Mix in 1/2 cup softened butter, 3/4 cup molasses and 1 or 2 eggs. Mix until completely blended. Cover and refrigerate 45 minutes. Preheat oven to 350°F. Roll dough to 1/4 inch thick on a lightly floured surface. Cut into shapes. Place cookies on lightly greased cookie sheet about 2" apart. Bake 10 to 15 minutes. Decorate with icing. Layer the ingredients in a 1 quart jar in the order listed. Be sure you pack down each layer. In a medium mixing bowl, Combine together 1/2 cup butter(softened), 1 egg and 1 teaspoon of vanilla. Then add the entire jar of ingredients, and Combine together. Drop spoon size spoonfuls onto a greased baking sheet. Baking time: 8 to 10 minutes, or until edges are lightly browned. Mix together flour, ground cinnamon, ground nutmeg, baking soda and salt. Set aside. Layer ingredients in order given in a 1 quart jar. "Important" make sure you firmly pack down each layer in place before adding the flour mixture. Attach these directions to jar: Oatmeal Raisin Spice Cookies Empty jar of cookie mix into large mixing bowl. Combine dry ingredience together. Add 3/4 cup butter or margarine softened, 1 egg, and 1 teaspoon of vanilla. Combine completely till blended. Shape into 1 inch balls. Place on a greased baking sheet. Bake for 11 to 13 minutes until edges are lightly browned. Cool 3 minutes on baking sheet. Yields: 36 cookies. Mix together the flour, baking powder and baking soda. Set aside. Layer ingredients in order given in a 1 quart jar. Press each layer firmly in place. It will be a tight fit. Add chopped peanut butter cups last. Preheat oven to 375 degrees F (190 degrees C. Remove peanut butter cups from jar. Set aside.Empty jar into large mixing bowl. Mix all dry ingredients well. Add 1/2 cup butter or margarine (softened), 1 egg, and 1 teaspoon vanilla, together blend. Carefully mix in peanut butter cups. Shape into 1 inch balls. Place on a greased cookie sheets. Bake for 12 to 14 minutes until edges are golden browned. Combine first flour and salt together and put into the bottom of a quart jar. Layer ingredients in the order listed above. Sand Art Brownies Preheat oven to 350 F. Pour in jar ingredience in a large bowl and mix well. Mix in 1 tsp vanilla, 2/3 cup oil, and 3 eggs. Pour batter into a grease a 9x9 pan. Bake for 25-30 minutes.